Welcome to the return of Birds at Large, the hard-hitting series where I ridicule the non-birding world's failed attempts to talk about birds and birding. I do it for three reasons: 1) how hard is it for these producers to just get the right birds? 2) things like this are what nerdy microgenre blogs like this are meant for, and 3) it's fun. Today's installment comes via John at A DC Birding Blog and involves the popular comedy show The Big Bang Theory. A subplot of the episode involves a bird landing on the windowsill of one of the main characters - who just happens to suffer from (the real affliction) of ornithophobia. The guy identifies the bird as a Blue Jay. It isn't. It's a Black-throated Magpie-Jay, a Mexican species that is sometimes kept in captivity (and apparently available as animal actors). There's a twist here, though. Normally I would throw petty insults at the producers of The Big Bang Theory for the incorrect ID and then congratulate myself with some Mountain Dew Code Reds in my parent's basement, but I've been beaten to the punch. 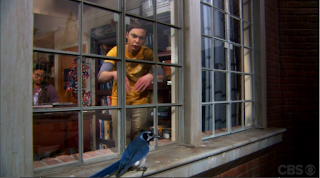 Soon after the episode aired The BirdChick tweeted to Bill Prady, the show's producer, about the misidentification. Mr. Prady responded, admitting the bird was actually the Magpie-Jay and claiming that its misidentification was due to the character being unfamiliar with bird species due to his phobia. An after-the-fact rationalization though it is, it's perfectly plausible and shows either some quick thinking from Mr. Prady or some commendable foresight on the part of the show. Unfortunately, the video of the show expired (?) before I was finished watching it, so I don't know how the episode ends. Thanks to John, BirdChick, Bill Prady and the rest of the outraged online bird misidentification culture (who've already updated the Black-throated Magpie-Jay's wikipedia page about the error) for this one. I knew that it was not a Blue Jay, but I only had books of American birds and I was not familiar with that one. About the episode. First, he fires a laser at the window to chase away the bird. It shatters the glass (which remains in one piece, with shatter lines). The bird remains. Then he eventually calls two girls he knows. They come over to try to talk him out of his fear. Soon someone opened the window, I believe it was him, to scare the bird and it flew in. The girls have it on their hands and soon get Sheldon to talk to it. 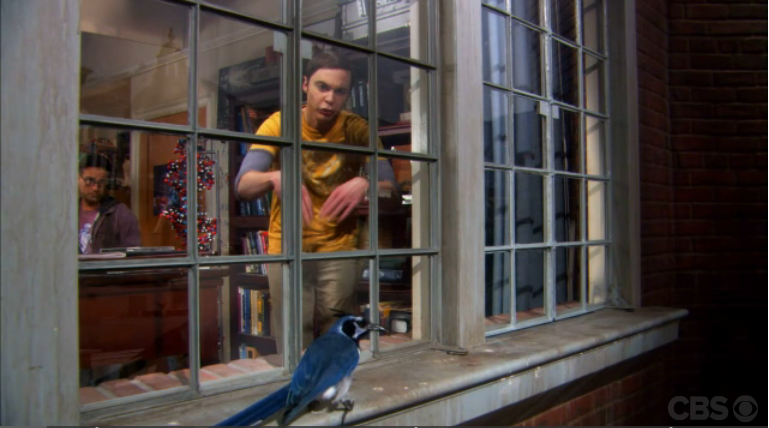 After he becomes friends with it, the bird flies back out the open window, and Sheldon is yelling for it to come back. When you look at television in the US, you see that most birds used in TV series or commercials that are supposed to be local birds, are indeed exotic species. I believe this is because it is illegal to keep most of our local fauna in captivity, but for some reason, keeping exotic birds caged up in the US is ok.
Hey - thanks for the id on the Big Bang theory bird - I knew it wasn't a blue jay - cool site - thanks again! The funniest thing about this blog is your just like the actors on the show......watch it and you will figure it out....there science geeks who mock people of lesser intellect .....much like bird people who mock people who mis identify birds....lol....don't be insulted, you have to see the humor in that! Thank you for helping me ID the bird! Got the boxed set of The Big Bang Theory for Christmas - after about 50 hours of viewing, we encountered this bird, which we couldn't identify using our trusty old field guide to N American birds. Thanks so much for identifying it - even we Brits knew isn't a blue jay! At the end of the show, Sheldon has retrieved the bird's nest and is incubating the one egg in it. I don't know if the bird, or the egg, ever show up again in the series. Ironically (and coincidentally, since the show's producers were obviously unaware of it), escaped black-throated magpie-jays are now breeding in small numbers in the San Diego area -- a fact that could easily have been woven into the script, since the show is set in southern California. Pity a show that strives to get the science right so much of the time missed this opportunity. I live in Mexico, outside of Mexico City. There is a bird very similar to the magpie jay of Big Bank Theory, but it is light grey. In every other sense, it is similar: very long tail, black throat, similar crest. Have any idea what it may be??? There are two of these Magpie Jays living on the Warner Bors. Lot where Big Bang Theory is filmed. Not sure of the connection but they are beautiful in person. They are currently feeding babies in their nest. They also make quite a screeching sound in person. The Big Bang Theory may be best understood by the spiritualists of the very best order. it's not just a thought or a Theory which may be simply understood by the employment of the senses alone as the senses have their own limitations within the physical manifested world http://www.mordocrosswords.com. I knew it wasn't a blue-jay but only because I know what a blue-jay does look like. However it aroused my curiosity as it is a very beautiful bird. I looked all over the internet but it wasn't until I put something as desperate as an entry including a short description of the bird and "The Big Bang Theory". And this was the first thing that came up. Thanks a lot for the info. Lol. Wife n I were brought here, too! Lived in San Antonio,Tx 4 years sounds like a road runner 2 me..grey an looks very similar to the bird in big bang..